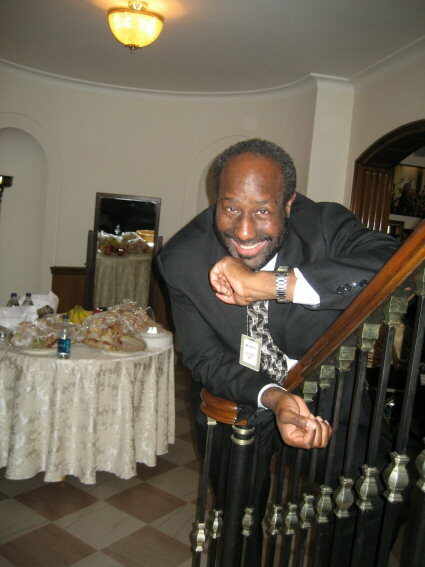 Pete sent me a note about a great gallery of pics taken by a singers at the White House (thanks, Bob and Cherrie!) in, apparently, April. They show not only the state rooms where they performed but the sub-basement dressing room! I’ve added a couple to the semi-secret Sub-Basement page. There’s one where people are seated under a coat rack, which you can also see in the 1992 HABS photo under the stairs. That suggests that there’s actually very little space down there. Also, I’ve widened the blog. I’ve learned a lot about blog templates and CSS since starting yet another website awhile ago. 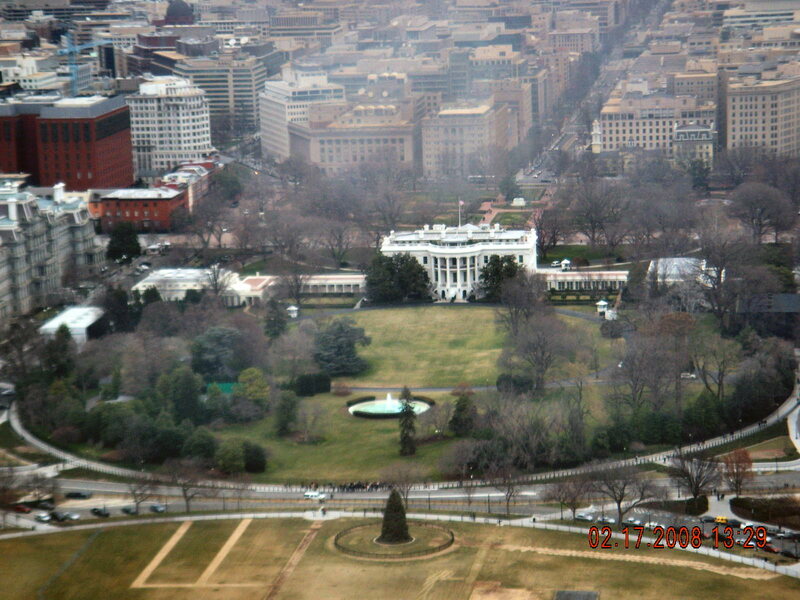 Pete pointed me to this pic of President’s Park on Picasa showing shadowy shapes on the east and west where work on the wings is proceeding, so I cleared up its cloudiness to clarify the clues. Do you have any information about the large light fixture that hangs in the North Portico, including the name of the manufacturer? It appears in a 1906 photo on your website but is not visible in a 1902 photo, so it must date from sometime in that interval. I added a number of new photos from a White House visitor named Daniel (go forward from here in his gallery) and a couple from older archives that I had a hard time placing. Most are in the residence. Also, I’ve received quite a number of photos by e-mail lately. Be assured that I’m looking at them, but I don’t always have time to respond or place them yet. Pete sent a link to a SF Sentinel article on DC power eateries. The first part is about the West Wing’s Navy Mess. There aren’t many photos, but there is one of the menu. The White House Historical Association has a new online shop that promises “several new sections and improved navigation.” Take a look. The site is still a bit slow, and the categories are a little too small (“Serving Accessories”?). In the front reconstruction, a pediment has been added that was not there: as William Seale points out in most of his books, the surviving wall section from Hoban’s second plan doesn’t show one. However, it does show fluting on the central columns, carvings on the frieze, and a more elaborate balustrade than ended up in the final plan – none of which is in the reconstructed image. Another detail shown in Hoban’s wall section is shown incorrectly: a carved strip of molding ran all the way along the second-story wall, flush with the base of the Ionic columns and acting as a sill beneath the second-floor windows. This exists at Leinster House, and was apparently adopted by Hoban. Below the stone molding on most of the windows, the wall section shows two long scroll supports, similar to the ones holding up the first-floor window hoods on the finished WH. However, at Leinster House, the second-floor central windows have a balustrade beneath their sill instead of carved supports, and I would guess that Hoban copied this detail as well. Also, the second-story window hoods were probably a little wider than shown in the picture, with the scroll supports beneath them resting on either side of the stone window frame, not on top of it (this is the arrangement both at Leinster House and the final WH). Plus, the windows in the first-floor center, within the rusticated area, are shown as arched. Since both Leinster House and the Charleston County Courthouse (the two buildings which are closest in form to Hoban’s original intent) have rectangular windows in the corresponding area, I suspect that the arching may be incorrect, and that the windows were sunk in rectangular openings in the rusticated wall. Finally, (and this is just a guess), the window hoods of the central windows on the second story might be more elaborate than the ones to each side – this is the case on the rear façade of Leinster House, and was common in 18th century Dublin architecture. My personal guess is that the window directly above the door had a triangular pediment, while the ones immediately to either side had arched hoods. This idea is based on the placement of the window hoods in the final WH front, where two arched pediments flank an arched transom, a curiosity given Hoban’s alternating hood-shape scheme elsewhere on the house. I was in Charleston about a month ago and took pictures of the Charleston County Courthouse, a building which, even if Hoban didn’t help build it (the records are lost), was certainly known to him and Washington. The back façade of the building has a curious window design which may represent how Hoban envisioned the central side windows of the revised three-story WH plan. The building was exactingly restored about 10 years ago to how it would’ve looked in Washington’s day – judging from old photographs they did an excellent job. On the first floor is a Palladian arched window, very similar to the one that today graces the East Room. The floorplan for Hoban’s second design indeed shows such windows on the side walls. However, this window is slightly different from the WH version – the smaller side window panels are one tier lower than the height of the “normal” windows to either side. To suit this change, the carved entablature just above the window does not arc over the central fan-shaped panel, as it does on the actual WH, but instead rests in two sections atop the side panels, while a much less elaborate arched window frame curves atop the center of the window. Also, the four Ionic pilasters holding the entablature up have different shapes: the two on the outside are rectangular, and the two inner ones are curved (this was shown in Latrobe’s floorplan of 1803, but is not visible on the window today). Finally, I suspect that if Hoban carried this scheme over to his revised WH plan, he added carving to the frieze on the entablature, and fluting to the Ionic columns, to make the side windows more harmonious with the front façade. In fact, such a carved frieze is visible in an engraving of the ruined WH walls after the fire of 1814 – it may have been altered, like the columns, in the rebuilding. On the third story is a lunette window with a carved keystone on top and a plain sill beneath. However, this one lacks the row of straight glass panes on the bottom edge of the WH lunette. I suspect that Hoban originally wanted to put the lunette window on the smaller third floor, and when he removed one floor he brought the design down, adding glass panes to the bottom to lengthen it. Between the wide top and bottom windows on the courthouse back, on the second floor, is a window of ordinary width, but with an arched top tier. Such a design would be awkward on the side of the WH, given the window hoods on the second floor in Hoban’s revised wall section, so I suspect he substituted a normal-shaped window with an arched pedimented hood. Such a curved hood would be complemented by the pointed and curved hoods which I suspect he also put on the center of the second-story front façade (see above). If you want to see the photos for yourself, ask and I’ll send them along. It’s very rare that the back of the courthouse gets photographed. As for why Hoban had such an elaborate entablature in the first place: I suspect that, as on Leinster House and the Charleston courthouse, Hoban’s very first plan did indeed have a pediment, but a plain one, without carving on it, or a balustrade or a complex entablature beneath. Then, when Washington ordered more elaborate stonework, he probably removed the simple pediment and added a fancy balustrade and frieze. Later, when he made his final plan, he added the pediment back on and scaled back the entablature carvings, but kept the new balustrade and drew an elaborate bald eagle image to be carved on the pediment (which was never acted on). As you can see, I’ve probably thought about this too much.